I did promise (several times) that I was working on a chart explaining where Windows 10 Mobile was going - and here it is. In short, future development of the current branch for mobile will probably end this Autumn, but that shouldn't detract from the continuity of updates to anyone running the OS, in terms of security fixes and applications, even into 2018 and beyond. You may get a sense from the chart below how complex a sequence I was trying to represent - the architecture of Windows 10 Mobile versus Desktop and how it would change going forwards, i.e. with time running from left to right. There's some guesswork, of course, though it's quite an educated guess. It's also realistic, this is no fan boy wish - and nowhere on the chart have I mentioned 'Surface Phone', though I couldn't resist emboldened and emphasising the word 'Mobile' on the right, since Microsoft will, at some point, produce more first party hardware that plays in the phone (or at least phablet) space - we just don't know what this will look like yet (this is my hope, though I'm not holding my breath). Over time then, the amount that's shared between Windows 10 Mobile and the latest 'Desktop' branch does reduce. 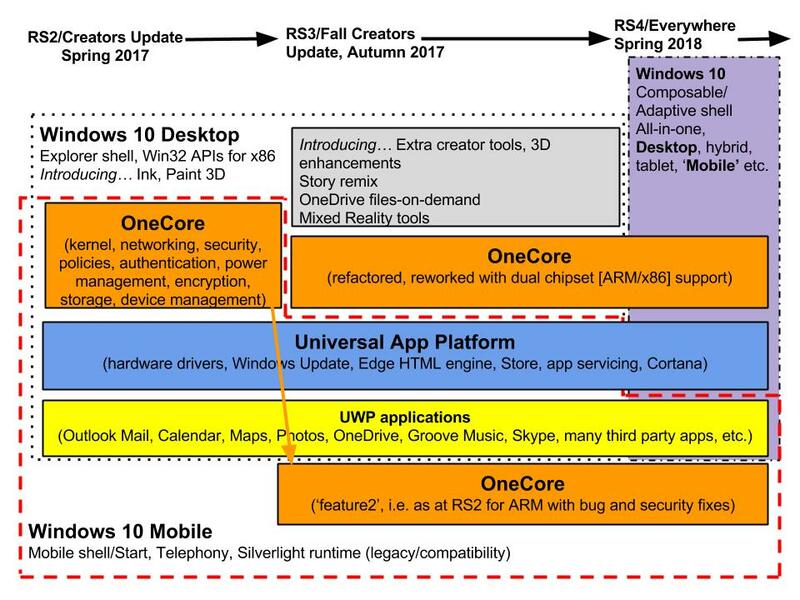 We've already seen 'OneCore' get splintered because of all the rework needed to compile it for 2017 ARM chipsets - ironic considering that OneCore already runs on ARM on the phone, but here we're talking about underpinning a much larger set of functionality in terms of UI options and hardware for Windows 10 on 'Desktop'. In any case, I suspect the decision was taken not to even try implementing it all for Windows 10 Mobile too (just) for completeness sake, because the latter OS wouldn't be able to take best advantage of most of the UI modules and ideas (Ink, 3D, Story Remix, Mixed Reality), not to mention the Gigabytes of code needed to support varied PC hardware. Thus 'feature 2' - OneCore for W10M was left essentially as it was for Redstone 2, with just the 'bits' that it needed implemented. Then, probably around this Autumn, I fully expect the Universal App Platform middleware to leave Windows 10 Mobile behind, since by that time Microsoft's last first party phones will be two years old and expectations of new core features be very low. So devices like the Lumia 950 XL and Elite x3, at the top of the Windows 10 Mobile tree, will be left on whatever official release 'feature 2' evolves to (which may well be named 'Fall Creators Update' too, for simplicity's sake). So, for 2018, there will be no more Edge or Cortana updates, for example, for the current hardware, whatever Insider ring or state they happen to be on. However, all of this misses that 99% of your experience on Windows 10 Mobile will carry on, unchanged. In fact, it'll still get better, even into 2018, with core Microsoft (and third party) UWP apps continuing to be updated at an impressive rate in the Store. Then there will be monthly ('Patch Tuesday') branch updates, bringing bug fixes and security updates, and these will continue for the life of each branch. So as long as you've got your smartphone onto the Creators Update (e.g. via the Release Preview Insiders ring) then you're essentially good until 2020 or so. You'll be protected against exploits and your UWP apps will carry on getting better and better. We've been seeing 'Windows Phone is dead' headlines in the tech world since 2013, four years ago, and, while the headlines may be technically right at long last (in that active development of the last Windows 10 Mobile branch will cease), anyone happily using (say) a Lumia 930 or HP Elite x3 will still be seeing daily app updates and monthly security patches for a long time to come. Maybe 'Plateaued' is a better term than 'dead' in this context? PS. And yes, of course I'd like new shiny pocketable toys running some variety of Windows 10 - as much as the next enthusiast - but the analysis above is what I expect will happen, not what I hope to happen.